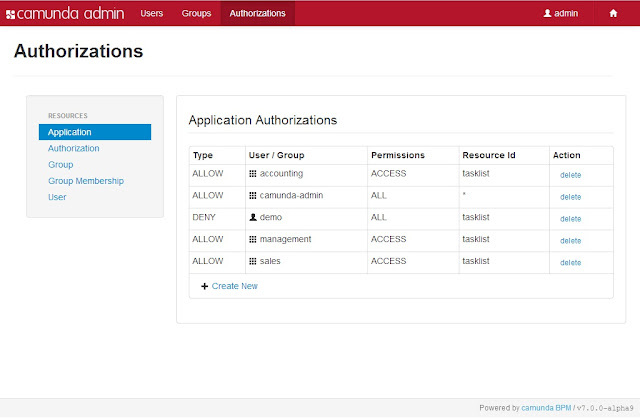 Today we are happy to announce the next alpha version of camunda BPM. Get it here. the tasklist is now part of the camunda webapp, you should find it at http://localhost:8080/camunda/app/tasklist. In total, 80 issues have been addressed including more than 20 bug fixes. Check out the complete list for all the details. Thanks to Kristin, Rafael and Clint for contributing to this release through their pull requests. And thanks to Stefan for your continuous fight for better IE compatibility ;-). A major contribution to this release was Daniel's work a sophisticated authorization mechanism. Through that mechanism you have fine grained control over which users and groups may create, view, edit and delete which resources. As a first step, we applied that mechanism to cockpit, tasklist and the admin app. From today on, you will only be able to access the apps you have been authorized for ;-). Furthermore, superpowered users may configure all this through the extended admin application. Manage users, groups and authorizations through the admin app. Daniel also worked on improving the history, both in terms of structure and performance. The result moved into our code base, expect a blog post about it, soon. In the meantime Roman and I overhauled the cockpit process definition and process instance view internals. The result is a small library called angular-data-depend and a cleaner code base. Each action you perform is reflected in the url. As a result, you are able to walk back through what you have done using your browser's history. Walking through your process data with cockpit and jump back using your browser's history. Last but not least, we created a process instance filter that tells you exactly where you are and what you filter for. 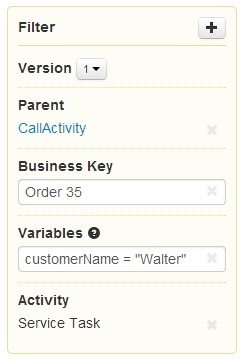 It allows you to narrow the displayed process instances based on their business key and process variables, too. Finds the process instances interesting for you. As always, tell us what you think on our mailing list.